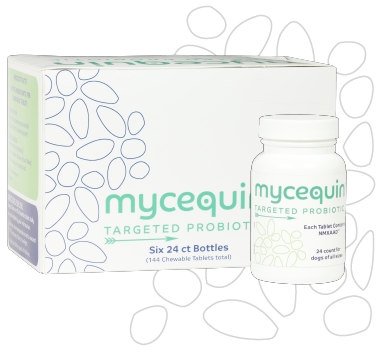 Mycequin™ is a targeted probiotic for dogs containing a proprietary blend of Saccharomyces boulardii and beta-glucan. S. boulardii is a type of yeast that helps maintain a healthy intestinal balance and beta-glucan helps support the immune function of the gastrointestinal (GI) tract. * Source: Amoung veterinary brands. Survey conducted among small animal veterinarians who recommended oral joint health supplements. what is a targeted probiotic? 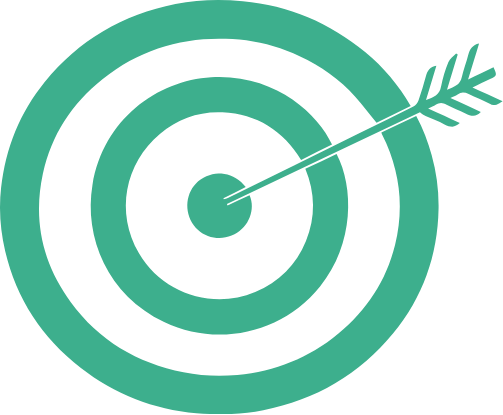 A targeted probiotic is one that has been formulated based on research in the target species (i.e., the dog) showing the efficacy of the ingredients during specific situations for a specific purpose. Bacteria-based probiotics have the potential to be compromised if given at the same time as an antibiotic. 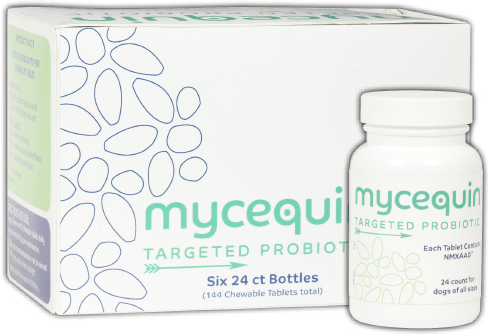 Because Mycequin™ contains yeast instead of bacteria, there is no need to wait between antibiotic administration and Mycequin™ administration. approximately 100 trillion microbial cells are present in the GI tract and make up the intestinal microbiome. that's approximately 100 trillion opportunities for imbalance. antibiotic usage is a common cause of microbiome imbalance, which can lead to GI issues. 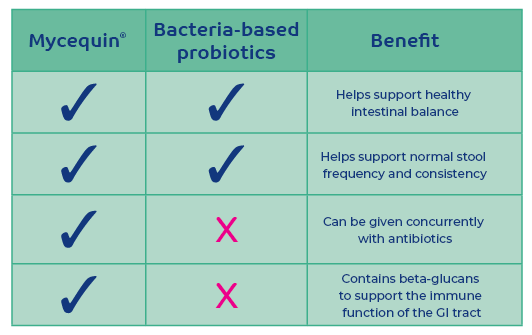 giving a probiotic when giving antibiotics can help support a healthy intestinal balance. Hydrogenated vegetable oil, microcrystalline cellulose, natural flavor, silicon dioxide, and yeast extract. Dogs: Give one (1) chewable tablet daily or as directed by your veterinarian. Store at room temperature not to exceed 77 degrees and out of direct sunlight. SIGN UP to Receive Exclusive Offers, Giveaways and Pet Wellness Tips! 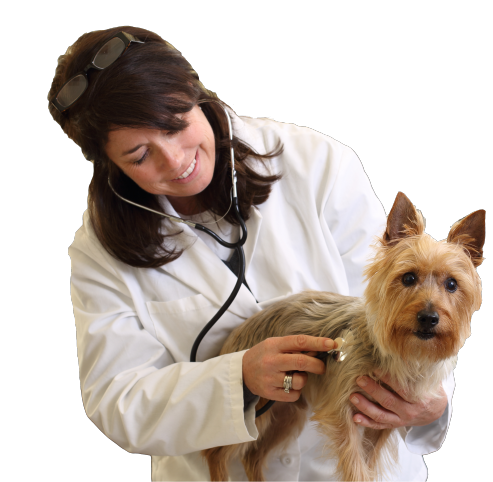 Yes, I wish to receive electronic promotions, special offers and new product information from Nutramax Laboratories Veterinary Sciences, Inc. ('Nutramax'). I understand I can unsubscribe at any time. Emails and other marketing communications from Nutramax, including offers or promotions contained therein, are intended for and available to United States residents only. By clicking 'JOIN NOW', I certify that I am a resident of the United States and at least 18 years of age. Thank you for signing up! Be sure to check your email for exclusive offers and pet information. 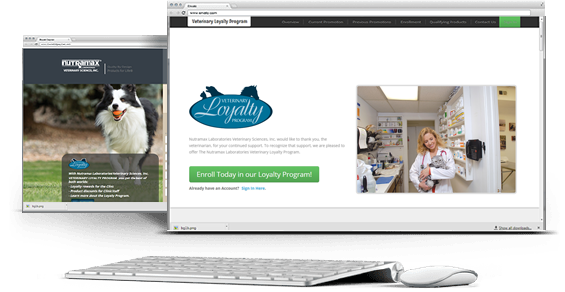 Loyalty Program Veterinarians earn a range of select premiums throughtout the year! Vet-EZ-Order.com Order from the full line of Nutramax products. Clinic Staff Program Employees of enrolled clinics enjoy discounts on select products. Exclusive Content Access exclusive content and educate pet owners!